Work: PM1 groom & walk, 3 short loops with off-side leading for variety & the dog for distraction/PM2 groom. Report: An easy day as a break from having to concentrate (him) & having to be patient (me). Given that, he was pushier than required. Pass but no star. The dog’s temporary barn reinstatement is hereby revoked. Ramblings for the Day: I’ve never been one for shopping as a cure for what ails. I wait in the parking lot while hubby goes into the grocery store. If poke my nose inside, the checkout total goes up by $25 for snacks. (Yes, he cooks. Yes, I’m lucky. Very.) Clothes shopping is agony. I have friends who act as personal shoppers when I absolutely have to buy new clothes. Before the LEGO store opened, I’d go to the mega-mall once a year, maybe. Even tack stores aren’t a money sink. I’ll buy what I need, but don’t usually stray off-list. I’m talking about shopping for things when you already have way more than you could ever use. Shopping itself as a soothing activity. Nope. Not me. Can’t see it. Except for …. Books. I spend hours in bookstores. I buy books even though my to-read pile threatens to take over the house. More than one bookstore cashier knows me by sight. In any new town, I will head for the local bookstore. New project? New trip? Buy a book. While the ebook will never replace the codex in my heart. they do allow me to indulge in buying books NOW! This year I gave up buying LEGO & books, specifically books as therapy, for Lent. This is the second year I have chosen a money-related Lenten discipline. One result is learning about my needs and weaknesses. The other result is that Easter Monday resembles a combination of Black Friday and Cyber Monday. Today’s post-Lenten splurge was on books for Rodney: horse agility, trick training, liberty work, Western trail. Anything to keep us occupied and entertained. 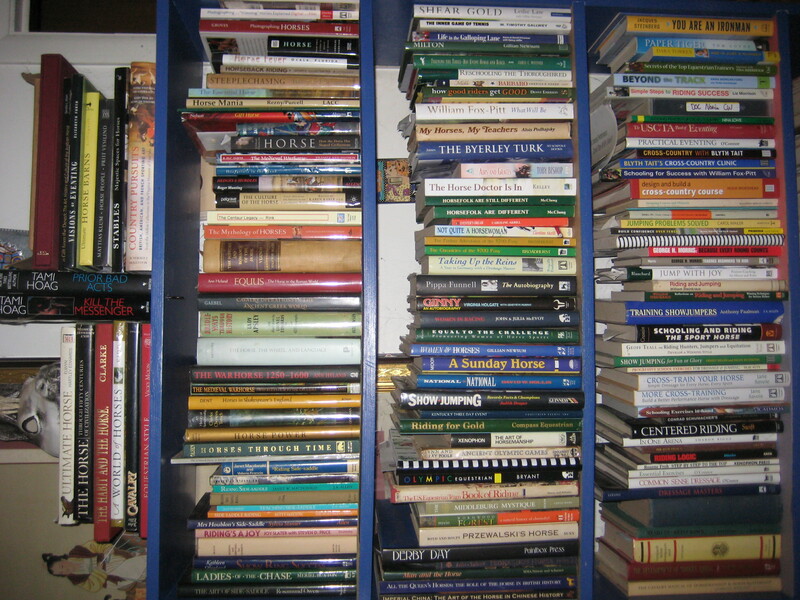 If nothing else, a large stack of books will project a comforting illusion of progress. What is your favorite horse how-to book? A comment related to your comment about the potential difficulties a mom going into a toy shop with her children might face. My children don’t much care about toys, so going into a toy shop will not be a problem. However, if you sent me into a book shop, well, we might never leave. A book shop FULL of ENGLISH books?? That would be the end of any holiday right there. Esp in London. Horse book heaven.